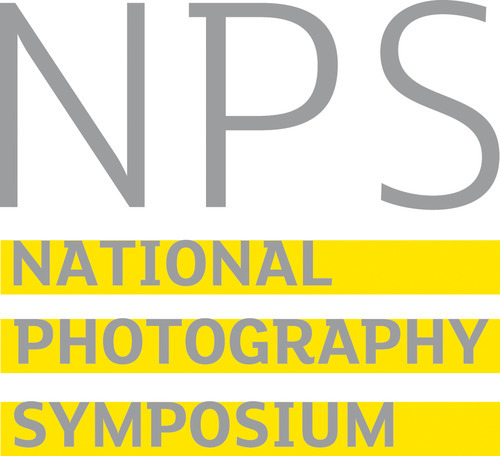 Paul Herrmann (Director of Redeye Network), Day 1 of the National Photography Symposium 2018, 1 November 2018. Photography by Drew Forsyth. 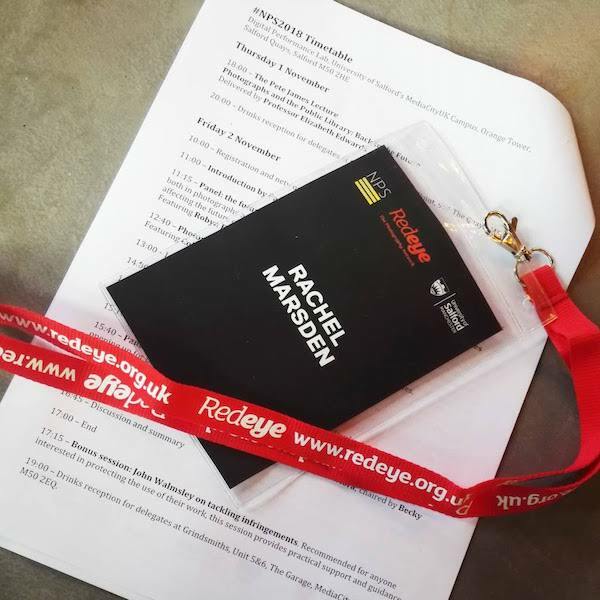 The first day began with an introduction by Redeye Network’s Director, Paul Herrmann, to the legacy of the late (and greatly missed) Pete James, to whom the opening lecture was dedicated. Co-founder of GRAIN, researcher, curator and archivist, Pete was described by his peer as a kind, gentle and completely unpretentious person, known for his erudition, conversation and side-splitting laughter, and more so his “engine of knowledge”, connection to audiences and thus, his reputation in the field of photography in the UK. Most recently, encouraging artists, including Vanley Burke and Paul Hill (and others), to deposit their collections in public libraries and fundamental in establishing the Photographic Collections Network (PCN). 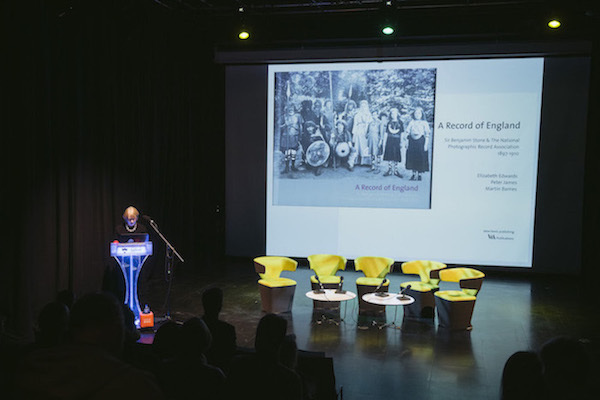 Throughout the three-days of NPS2018, Pete remained in mind, where conversation often returned to his approach and work, as reflected in the memorial lecture given by Professor Elizabeth Edwards. Setting the foundation for NPS2018, Elizabeth presented ‘Photographs and the Public Library: Back to the Future’ by mapping the symbiotic relationship of libraries to the history of photography through a sense of hopefulness and positive action. She began by highlighting the importance of the library in photography’s firmament through the emergence of “local collectionism” – specifically, the gathering of photographs in the late 19th and early 20th centuries. Here, “Back to the Future” defined the inclusive and inscriptive nature of the past for the future – an inclusiveness (photographic inscription as historical record) and immediacy (providing alternative histories to mitigate the terms of how to collect). 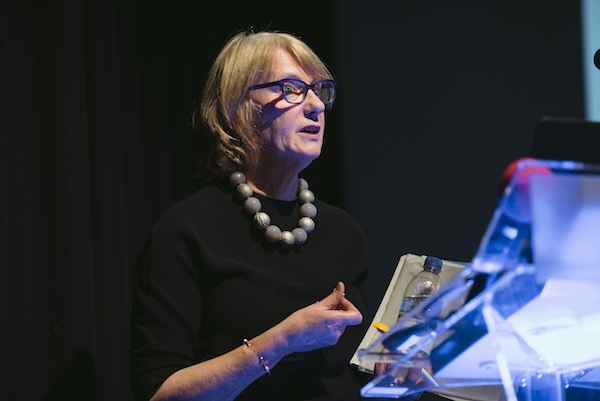 Professor Elizabeth Edwards, Day 1 of the National Photography Symposium 2018, 1 November 2018. Photography by Drew Forsyth. Once seen as the university of the everyman, the library provided civilised, liberal and civic identity through free access to reading, often becoming the cultural powerhouse of the town whilst strengthening civic pride. By “plotting historical mayhem” through photography, they became fundamental in the local and regional collected memory of civic action. More directly, photography as record – inscriptions, infrastructures, landscape and experience, local and modern. As such, the library and their collections of photography gave strong definition of place to define people or community – a topography of the past, firmly rooted in the local. This record of local conditions was also used to understand what was historically relevant at the time. As part of the latter, Elizabeth notes a “photographic bibliographic entanglement” – photography as objective knowledge networks in the library (in themselves reliant on networks), where the visual is an often unarticulated component. She acknowledged when engaging with photographs, it creates strong histories and local belonging linked to wider agendas of community history – “belonging to place” – alongside an optimistic view of what photography could deliver as part of collaborative practice through a process of social exchange, re-invigorated by contemporary communities. As a visual and historical anthropologist, Elizabeth wants to listen to what people say and give voice, bringing into focus the importance of taking photographs out into new public spaces – “use the library as a site of free exhibition” – for local visual histories to become visible, relevant and dynamic to new audiences. Throughout her identification of collections of photographs clustered in the early 20th century, she consistently returned to the notion of hopefulness and “Back to the Future” as best explained in the mission statement of the on-going partnership project, Connecting Histories. What is the relationship between museums, galleries and libraries? How do the circumstances of both libraries and collecting differ today? As citizens, how can we encourage libraries to collect and what should be collected? For photographs “living in limbo”, where do they sit beyond disciplinary archives? As archives, what do we mean by survey and nostalgia and are they related? In a time of precarity and insecurity, where socio-political, economic and cultural conditions are changing every single day, we are often unsure as to what is fake or truth, creating a constant questioning and feeling of flux. Photography has the capacity to be the tool to document, translate and define this moment and as Elizabeth has stated, to influence and develop “a future for all”. Although, the legacy and resonance of NPS2018 is difficult to track and quantify, one thing is clear: without provocation, there is no action; without action, no legacy for a developing future. Go home and find community relevant photography that would help to build a bigger picture of where we all live (or once lived), and get involved with your local library – as I have today. 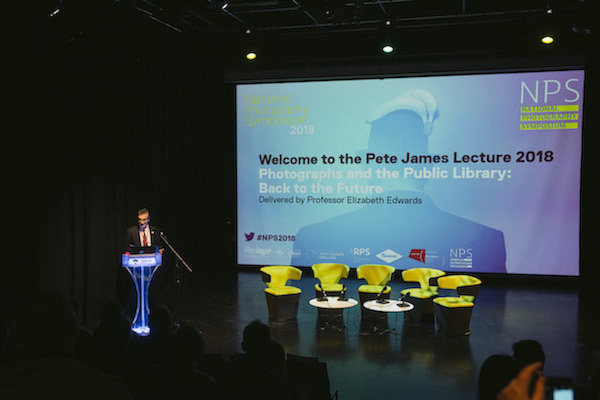 This blog post was written from my local authority library in Stafford, where I’ll be returning throughout this week to share further reflections from NPS2018. This entry was posted in National Photography Symposium 2018 and tagged collection, collectionism, conference, Connecting Histories, Drew Forsyth, GRAIN, libraries, library, manchester, National Photography Symposium, nationalphotographysymposium, NPS2018, Paul Herrmann, paul hill, PCN, Pete James, photographer, Photographic Collections Network, photography, Professor Elizabeth Edwards, Rachel Marsden, redeye, Redeye Network, salford, symposium, University of Salford, Vanley Burke on November 6, 2018 by Rachel Marsden.